This was not your usual August Bank Holiday, there was not a cloud in the sky and the temperature was rising already, however this was the day I was going after marathon number 12! I suffered from my usual sleep deprivation the night before and as I dragged myself out of bed I felt exhausted at the thought of what the next 4-5 hours would bring. Needless to say I wasn’t looking forward to this one. 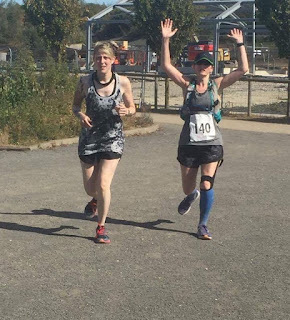 Arriving at Betteshanger Country park I became anxious, the last time I had attempted to complete a lap style marathon I had failed, dropping out at 18 miles with 3 laps left to do. I was mentally finished even though physically I felt fine. However I was determined to finish this time, I even had a trick up my sleeve to help me get round the last 3 laps, but all will be revealed later. I was greeted by name by a very cheery Rachel, she issued my number and wished me luck.There was a big turnout for this marathon and i wondered if it was the lure of cakey treats laid out at the aid station. As I pinned my number on I tried to convince myself that it was a point to point race and not a lap race , all I needed to do was make it to 6 checkpoints and would have completed another marathon. Axiously waiting to start marathon no 12. At 9am we all set off, although a little crowded at first it soon spaced out nicely and to my relief the route was interesting and not just flat cycle path. It was slightly undulating with a mix of woodland trails and a few inclines. 1 lap was 4.37 miles and you needed to complete 6 laps altogether for marathon distance. The first lap zoomed by and soon I was running into HQ for a quick water intake to cool down . I dashed back out, aware that it was getting hotter and the route didn’t offer much in the way shade. 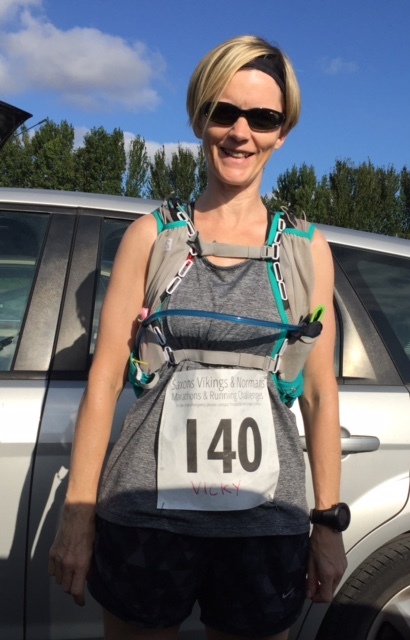 I slowed my pace to 5 miles per hour to help reduce early fatigue and I ensured that my electrolyte and fluid intake was topped up every 5-10 mins. I held on tight to my checkpoint theory and soon lap 2 was nearly smashed. On my way back to HQ I saw Cazzie on a bench waiting for me to pass, we both smiled and then she updated me on the final stages of my race strategy. I was now feeling positive as I knew I couldn’t fail. On the last km I passed my dad, my sister and my friends Sharon and John and their 2 children, Zach and my number 1 fan Abby. At HQ I drenched my hat with water and drank loads, before heading back out I spoke to Rachel. “Please do not let me ring that bell before I’ve completed 6 laps!” Basically if the bell was rung by you it meant your race was done, at Jeskyns park I rang it at 18 miles. “Not even if I’m on my hands and knees” I joked, but I really meant it. I trotted back out and smiled to myself. 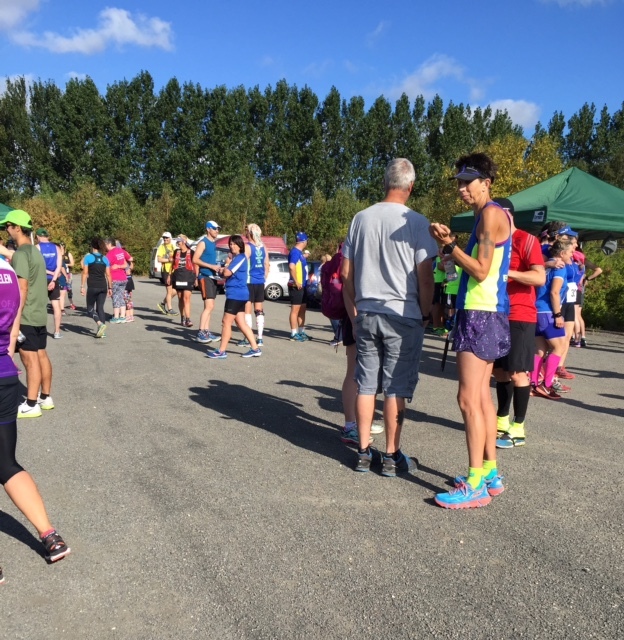 It was probably 29 degrees by now and runners had started to drop out at half marathon point, but the beauty of these challenges is that you still get the stunning medal and goody bag whatever distance you complete. I ran past a collective of friends and family all happily waiting for my plan to come to fruition, I felt relaxed on my solitary run, not once did I worry about time or pace. With lap 3 coming to an end it was time to dig deep and get it done! I set off again from HQ or checkpoint 3 as I like to call it! The plan was simple, for the last 3 laps I would have company to help we get round and make sure I didn’t quit! My fabulous sister Tracy was first up, I collected her about 1km around the route and it worked wonders. Just having someone to chat to was awesome, we set off at a different pace as the sun beat down on us and as we laughed and chatted away the lap just flew past us. Before I knew it lap 4 had been completed. Next up was John, my fellow Viking from my run club in Rochester. He was just what I needed , funny, calm but boy did he not let me slack off, although he did let me walk up at least 1 hill. Again the lap was completed with a smile and at HQ we had a quick drink of water and looked at all the amazing cake that had be made by some of my fellow runners. Traviss had issued prizes for the best cakes and marzipan creations and was smiling form ear to ear, he was in cake heaven. Lovely cake supplied by Sharon & Family. This was it, I tried not to think about this being my last lap, but somehow I had made it to nearly 22 miles and still had a little left in the reserve tank. I can’t express to you how much my whole body was now hurting! Literally everything was aching, legs, knees, hips, back, but with 4.37 miles left to go I knew I could do it. Caz was now running with me whilst all my lovely supporters made their way back to HQ. I moaned to Caz about my aches and pains, but she just smiled and told me to crack on and do what I needed to do! The last few miles were painful, the inclines seemed higher and the flats seemed never ending, it took everything I had in me just to keep my legs moving. Eventually we turned the last corner and I could see the finish line. Caz supporting on last lap. 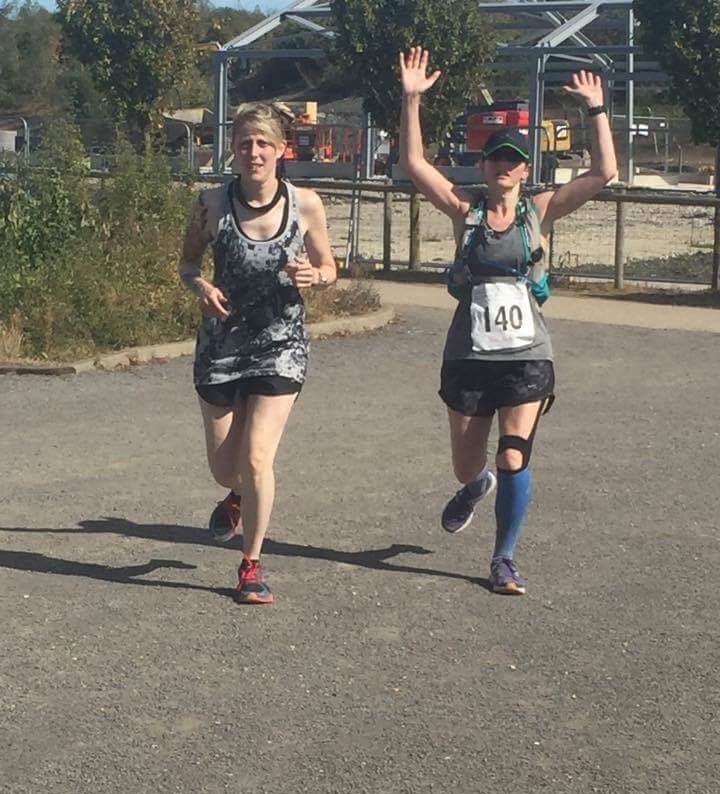 My dad was taking photo’s as we approached the finish line and everyone else was cheering me in! It felt awesome to finish with so much support, I picked up the bell and rang it loudly for all to hear. I had completed marathon 12 with some help from my extra special friends and family. It was such a special moment and although I was overwhelmed I managed to hold it together as my medal was adorned around my neck. Exhausted but elated I said my goodbyes and headed home, it had been a long day and all I wanted was a pizza and my bed. Ringing the bell, at last. An uncomfortable night with no much sleep had not left me in the best of moods, my back had gone into spasms at 3am and by 6am I felt like I had been hit by a truck! My legs had completely seized up, my back was in agony and I was really tired. I needed a lot more rest, more food and more fluids. 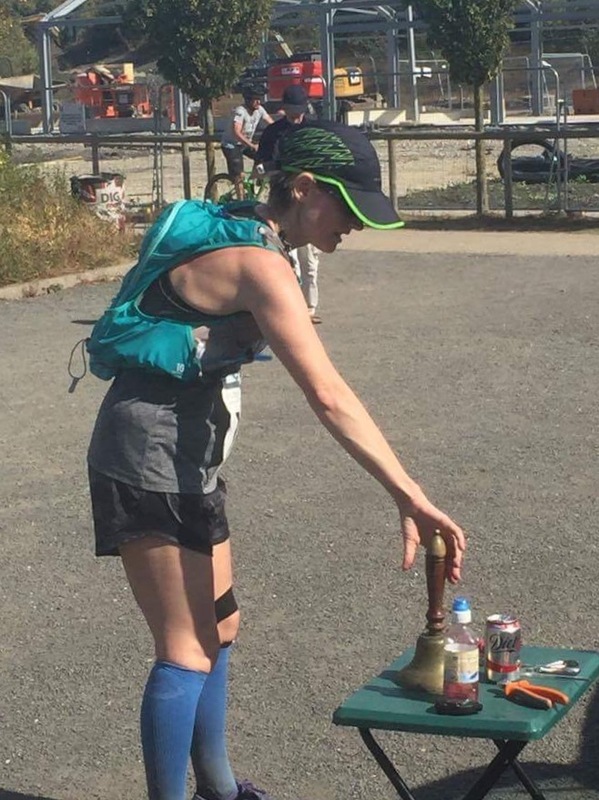 I was laid up for a whole 2 days before I felt even remotely normal and to my delight when I got around to checking the results table I was astonished that I was in the top ten women for running marathon distance. The entire week was spent napping on the sofa and eating and thankfully by the weekend I managed a 5km and a few circuit training sessions with my pt clients. Rest and recovery is the key and sometimes I beat myself up and compare myself to others that are running marathons every week. How do they do it without feeling so rough? Maybe they are just conditioned after years of running marathons and they have their own strategies and training regimes? Or maybe they do struggle like me but they never show it? I might just ask them that question next time. Anyway after only running my first marathon in 2014 I have now racked up 12 which is something to be proud of and with number 13 looming this weekend it feels good to have a few under my belt and a few more lined up…..approx 38 to go to complete my 50 before 50 challenge. This marathon was part of the 10 marathons I am running to fundraise for Dame Kelly Holmes 5 big charities, Hospice In The Weald, Mind, Myeloma UK, The Pickering cancer drop in centre and The Dame Kelly Holmes Trust. Thank you for reading my blog and watch up for my next one on marathon number 13, hopefully not unlucky for some! Follow my journey on Twitter @runtoryrun Instagram @run_tory_run or connect with me on Facebook.